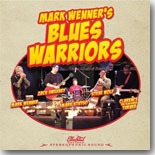 Veteran Nighthawks harmonica player Mark Wenner has a separate side project, called Mark Wenner's Blues Warriors. It's this month's Pick Hit. Southern California band Blue Largo has a surprisingly diverse CD, Before The Devil Steals Your Soul, making it a good choice for our Surprise CD this month. This month's Flashback takes a look a smaller subset of a bigger anthology of classic recordings from Cyril Neville. Our What's New section features new CDs from Rory Block, Boz Scaggs, Mindi Abair and the Boneshakers, Little Victor, Beth McKee, Bruce Katz Band, Al Basile, Whitney Shay, Steve Howell and the Mighty Men, RC and the Moonpie Band, Vanessa Collier, and more.